painting, building sites or manufacturing plants, or when you need air in a flat tire. Portable air compressors work with two main elements which are the compressing system (vane, piston, or impeller) and the power source such as an electric motor or a Gas engine. The compressing system will minimize the volume of the atmospheric air then the pressure gets increased from the assistance of the power source. The pressure setting knob is available to be manipulated by the user for when the pressurized air is needed. Portable air compressors will vary in sizes based on the type of projects that are requiring its use. The air compressor is made lightweight enough to be transported on wheels from one job to the next with ease. Their time saves for many construction sites. Here we will be showing your the portable air compressor buyer’s guide to help you find the right one for the job at hand. Here is the Porter-Cable PCFP02003 3.5 Gal. 135 PSI pancake compressor that comes with a durable oil-free pump that is low maintenance and built for longevity. Constructed with a low Amp 120-Volt motor that can be easily used with an extension cord or in cold weather. Weighing in at 26 lbs it makes for a perfect assistant to many industrial workers. Q – How many Amps does the compressor use?A – 10 amps. Q – What tools are needing to pump air in tires? A – You will need an air hose, an air chuck to fit valve of the tires, and an air hose with fittings for both ends of the hose. 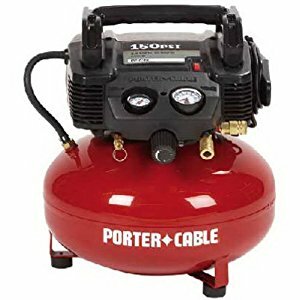 Q – Can I use this compressor for frame nailing? 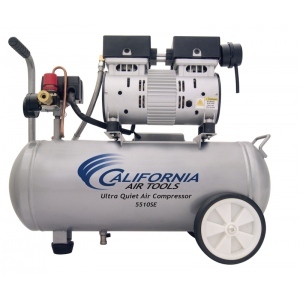 Here is the California Air Tools 10020C Oil-free compressor that is ultra quiet with its 2.0 horsepower with only 70 DB of sound. It operates at 180 RPM and can run for longer continuous run times which increases duty cycle. Engineered with high-performance and durability ready for the job. The air connectors could be another inch further away from the front panel for easier hose connections. Q – What is the difference between the 10020C and the previous 10020 model? A – The 10020c has replaced the 10020 model. The newer model is almost 6″ taller and is much easier to maneuver around but the rest such as time to fill, and operating pressures are the same. Q – Can this unit blow out sprinkler lines? A – Yes. The air compressor can flush out the sprinkler lines. 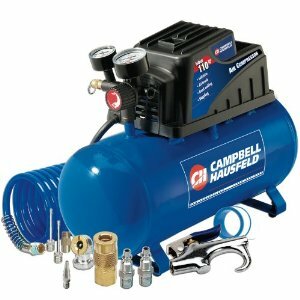 Here is the Campbell Hausfeld FP209499 a 3-gallon air compressor kit engineered to handle many projects. Ideal for household projects such as inflating bike tires, sporting balls, car tires, etc. It can also be for powering airbrushes and air nailers. The gauges are conveniently placed and easy to read. It is also maintenance free with the oilless pump. A compact design but with a lot of power to handle the jobs it was built for. Q – Is the air compressor quiet?A – No. You won’t need ear plugs but don’t expect to have a conversation while it is running. Q – Is the PSI adjustable? A – Yes! You can adjust the PSI up to 120. Q – What size is the hose? Q – After the compressor has been on how long does it take to refill? A – Kinda slow the first time, 6 to 8 minutes, but after that, the time is reduced to about 2 minutes. 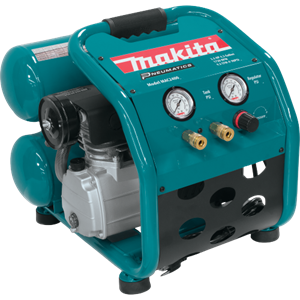 Here is the Makita 2.5 HP Air Compressor engineered with a pump cast-iron cylinder and piston for much higher output for two nailers with much less noise. It will produce industrial power and results, and the durability has greatly improved. The MAC2400 comes driven by a 2.5 horsepower and has a greater stroke and bore for enhanced compression with faster recovery. Q – Can I use automotive synthetic oil?A – No. The Makita air compressor requires the use of 30 weight non-detergent compressor oil. Q – Can it fill a truck tire to 90 PSI? A – Yes. Goes up to 130 PSI. Q – Can it run impact tools? A – Impact tools are used for only a few seconds at a time, so they don’t use much air and even a small compressor will keep up with them. So yes, it will run most impact tools. 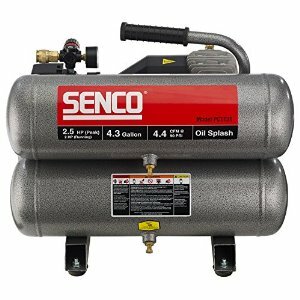 Here is the Senco PC1131 Compressor, 2.5-Horsepower peak, and 4.3 gallons. The cast-iron sleeve and cast-iron head cylinder keep the air compressor running for much longer run time. The standard equipment comes with a pressure gauge, and a 1/4″ universal coupler. Delivers 4.3 CFM at a 100PSI. Q – Is it oilless or oil filled?A – Oil filled. Q – Is it a loud air compressor. A – a little bit noisier than most but it won’t require ear protection. Q – Can I impact, grinders or drill continually with this air compressor? A – It’s not large enough for continuous work. Here is the Makita 3 HP Air Compressor engineered with a pump Big Bore cylinder and piston for much higher output for two nailers with much less noise. It will produce industrial power and results, and the durability has greatly improved. The MAC5200 comes driven by a 3.0 horsepower and has a greater stroke and bore for enhanced compression with faster recovery. Q – Since it has a smaller tank will it continuously cycle running a 1/2″ impact wrench?A – I can run a 1/2″ impact pretty regularly. It doesn’t cycle that much. It has a difficult time with a cut off tool or angle grinder. 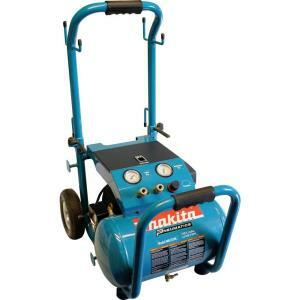 Q – Has anyone tried this air compressor with a plasma cutter that needs 5-7cfm(90psi)? A – I’ve used it with my Eastwood 40 cutter rated 5-7 CFM at 20-60 PSI, and it works fine. If you’re plasma cutting then a larger 60-80 gallon 10+ CFM compressor will be better suited. Make certain that you get an air dryer for the air line. Q – Would this MAC5200 air compressor be good enough for spray painting my car? A – It has little trouble keeping up with a 3/8″ air ratchet. It works just fine with a 1/2″ impact gun. Die grinder no chance, no way. Here is the California Air Tools Ultra Quiet 5510SE oil-free air compressor built to be the quietest air compressors in today’s market operating at 60 dB of sound. The powerful 1.0 Horsepower motor runs at only 1680 RPM for less wear and much less noise. The engine has been engineered to increase the duty cycle for longer continuous run times. The oil-free dual piston pump is meant to improve the performance and enhance the unit’s durability. Q – What would be the noise rating?A – 60db. You can have an entire conversation while standing over it without the need for shouting. Normal conversation is 78db. Nice and quiet! Q – Yes. However, you’ll need to have a shutoff valve and use a flexible connection to whatever you attach it on. A hard connection will make the piping manifold on the compressor fail due to vibration. Q – Will the compressor be good for airbrushing? 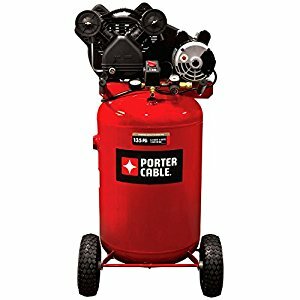 Here is the Porter Cable PXCMF220VW 20-Gallon air compressor that is oil-free and comes with a long life induction motor. The motor and pump have a fully enclosed shroud that hides the working components, and the compressor is low maintenance. It has a low voltage start up and is ready for many projects with its large capacity 20-gallon tank. Q – Can this air compressor be converted to 240v?A – Yes! 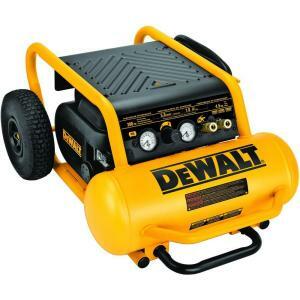 Q – Does anybody use this air compressor with an impact wrench? If so, how was it? A – Yes. I’ve used it many times for vehicles and haven’t had any problems with it thus far. I am using a higher end impact drill that’s better than average, and it doesn’t run out of any air when pulling tires all at once. Q – Is the tank drain valve easy to access and operate? A – Yes. It is very accessible and easy to use. Nice compressor. 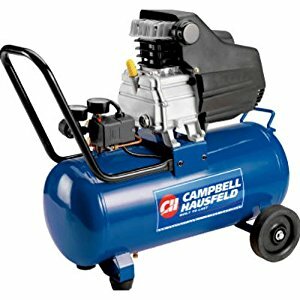 Here is the Campbell Hausfeld 8-gallon air compressor made to be one of the quietest air compressors in today’s market and with only 68 dba it is highly ideal for those working in areas where noise pollution is troublesome to nearby workers. It comes oil-free making it low maintenance along with the pump being maintenance free which means convenient on a continuous basis. Q – Is it really as quiet as advertised?A – Yes!! If not even MORE quiet than is advertised. Great for work when you don’t have a private workspace. Q – Does it include hose and chuck? A – Only includes the compressor. Q – Is there a drain on the bottom of this unit? Q – Can this keep up with trimming out an entire home? A – I was using my brad nailer with the compressor to trim a large room in pine, and it worked great. A nail gun was also used with the compressor. You will love how quiet the machine is. Here is the DEWALT 4.5 Gal. Portable Electric Air Compressor that comes with convenient pneumatic wheels that make transporting from one job to another easy. The air compressor comes with a 4.5 gallon and is used to support framing nailers (not included) and roofing. The air compressor can be stored in a vertical position to save space. Strong and durable with its steel construction. Noise levels are low as it provides a quiet work atmosphere. Q – Can the compressor be run on the storage position -upright?A – It is not recommended. Even though it will run on both positions and would risk in damage in low oil lubrication to the cylinder. Q – What is the temperature rating to start the compressor? A – There is nothing about the temperature rating in the manual, however, many consumers say that anything below 35 degrees has a difficult time keeping up and reaching more than 100 psi. They also say to have it drained before the temperature starts dropping to freezing temps. Q – Do any attachments or air hose come with the compressor? A – No. You will have to purchase the air compressor accessories separately. Adding the impressive power of air using a pneumatic tool to make certain that job gets done and fast! The buyer’s guide below will showcase factors you need to consider before purchasing your first or your next air compressor to fit your needs. There are two categories for air compressor units which are portable and stationary. Electric Compressors: The compressors powered by electricity run on a standard household voltage of 110-120v. The motors that do exceed two running horsepower will need a 220-240v outlet. Seeing as how electric air compressors do not emit fumes they are an ideal choice when needing an air compressor indoors. Keep in mind that if you power the compressor to a generator, this could potentially harm the motor. Roll Cage: The roll cage will protect the air compressor from being damaged, crushed, or broken on a construction site. Air-Cooling System: This will keep the pump cool to extend the life of the motor. Thermal Overload Switch: This system will automatically turn off to keep the motor from overheating, increasing the tool life and protecting the compressor altogether. ASME Certification: Showcases high-quality material and high-quality craftsmanship which is identified on the tank with the certification label displaying that the compressor meets the standards of the American Society of Mechanical Engineers. Single-stage compressors: These have one or more cylinders producing compressed air at the same output pressure. Two-stage compressors: These have at least two cylinders. The first-stage cylinder will feed the air to the second-stage cylinder that further compresses the air. The second stage cylinder increases the tank pressure to roughly 175psi. The importance is having more air stored in the same size tank, allowing tools to run longer increasing productivity. The feature is useful for high-demand work, such as continuous machine operation in an auto shop. Oil-lubricated compressors: Need oil to run similar to a car’s engine. The oil will lubricate the moving parts in the pump to avoid excessive wear. They are larger and heavier than equivalent oil-free models, and oil must be monitored and changed to prevent premature failure. Oil-free compressors: Oil-free compressors are a lot smaller and lightweight than the oil lubricated compressors, making them a favorable choice for job site and home projects where portability is a plus. The size of the tank will be based on how long the air tools will be able to run for before the compressor can turn back on. The air compressor tanks are to be rated in gallons from 1 gallon to 80 gallons. If using an air tool that needs a higher volume of air for ongoing continuous use then it’s recommended you aim for a larger tank and use smaller tanks for smaller jobs. If a tool needs just a quick burst of air, like pneumatic brad and finish nailers the air tank will drain much slowly and you will only need 2-6 gallon tanks.